CHESS NORTHERN SOUL-KEEP ON DANCING. Chess Northern Soul-Just Keep On Dancing. Nowadays, hardly a week goes by without a new Northern Soul compilation being released into what an increasingly competitive marketplace. Some weeks, there are several Northern Soul compilations released and the competitions suddenly becomes even more fierce. That comes as no surprise, as record labels big and small suddenly realised just how popular Northern Soul was. This resulted on many labels jumping on the Northern Soul bandwagon. These record labels realised that given the appetite for Northern Soul compilations, that these compilation were profitable. They are if done properly, and that was the case with Chess Northern Soul-Just Keep On Dancing, which was originally released by Kent in 1996, and has just been reissued. It’s one of the best Northern Soul compilations that money can buy. Sadly, for every Chess Northern Soul-Just Keep On Dancing there’s countless hastily cobbled together cash-ins and others whose legality is questionable. Sadly, it seems, not all Northern Soul complications are created equal, and there’s huge differences in quality. Sometimes, it depends on the compiler, what the source of the music is or the label releasing it. That is why Northern Soul complications can be described as the good, the bad and the ugly. In the case of Chess Northern Soul-Just Keep On Dancing, it’s a beautiful siren whose smouldering brown eyes are capable of melting your heart. It’s also one of the best ever Northern Soul compilations ever released. That comes as no surprise given the quality of music on Chess Northern Soul-Just Keep On Dancing. 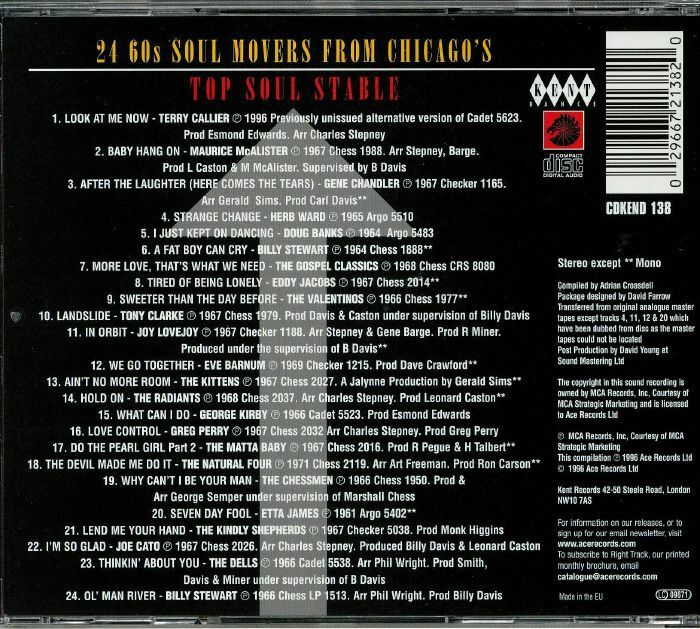 There’s contributions from Terry Callier, Gene Chandler, Doug Banks, Billy Stewart, The Valentinos, Tony Clarke, Eve Barnum, The Radiants, Greg Perry, The Natural Four, Etta James and The Dells. Chess Northern Soul-Just Keep On Dancing is a veritable musical feast. So is Gene Chandler’s After The Laughter (Here Come The Tears) which was recorded while he was signed to Checker. It’s a hook-laden emotional roller-coaster. The tempo drops on Herb Ward ’s Strange Change which was released on Argo in September 1965. Stabs of horns, sweeping strings and soulful harmonies accompany a lovestruck Herb Ward. In March 1964, Billy Stewart released Count Me Out as a single on Chess, and tucked away on the B-Side was a cover of Maurice McAlister’s A Fat Boy Can Cry. It’s a soulful earworm tinged with humour which sadly, would fall foul of the PC brigade. From the opening bars of The Gospel Classics’ More Love, That’s What We Need it’s obvious something special is unfolding. It was released on Chess in August 1966 and features a soulful vocal powerhouse during this irresistible stroller. Soul survivor Bobby Womack began his career with The Valentinos, who released Sweeter Than The Day Before on Chess in October 1966. It’s a memorable soul stomper, that bursts into life, and is still guaranteed to fill a dancefloor. If someone has never heard of Northern Soul, Tony Clarke’s Landslide is the perfect musical explanation. It was released by Chess in Britain in March 1974, and has been a favourite of DJs and dancers ever since. The Kittens’ uptempo soulful dancer Ain’t No More Room was released on Chess in October 1967. Sadly, the single but never made any impression on the American charts. A few years later, this hidden gem was discovered by Northern Soul DJs and Ain’t No More Room was soon filling dancefloors across Britain. Greg Perry released Love Control on Chess in November 1967. It was arranged by Charles Stepney and produced by Greg Perry, whose vocal is heartfelt and soulful as horns and harmonies accompany him. They play their part in another hidden gem from the Chess Records’ vaults. The Natural Four released Give A Little Love as a single on Chess in August 1971, it passed record buyers by. However, in Britain Northern Soul DJs flipped over to the B-Side and started playing The Devil Made Me Do It. It’s an intense, uptempo floor filler arranged by Art Freeman and produced by Ron Carson. Etta James released some of the best music of her long and illustrious career on the Chess’ brothers’ labels. In October 1961, Etta James released It’s Too Soon To Know as a single, but the Billy Davis composition Seven Day Fool is the stronger of the two songs. It’s an uptempo dancer where Etta James’ combines raw power, sass and emotion. Joe Cato only ever released the one single Save Our Love. It was released on Chess in October 1967 and featured I’m So Glad on the B-Side. It’s a much stronger track that was arranged by Charles Stepney and produced by Billy Davis and Leonard Caston. With its impassioned vocal and a carefully crafted mid tempo arrangement it’s the one that got away for Joe Cato. The Dells released Thinkin’ About You as a single on Cadet in June 1966. It features as impassioned, emotive and powerful lead vocal as the rest of The Dells add sweeping, soaring harmonies. It’s a powerful combination and a reminder of The Dells at their best. Closing Chess Northern Soul-Just Keep On Dancing is Billy Stewart’s Ol’ Man River which may soul fans won’t have heard. It featured on the B-Side of Every Day I Have The Blues which was released on Chess in June 1967. Ol’ Man River features Billy Stewart at his most soulful as on this beautiful ballad, which closes the compilation on a high. Many newcomers to Northern Soul are unsure where to start when they see the huge amount of compilations available and suddenly, it’s a lottery. Choose the wrong compilation and their love affair with Northern Soul can be short-lived. Not if they choose Chess Northern Soul-Just Keep On Dancing which is one of the best compilations of the past three decades. 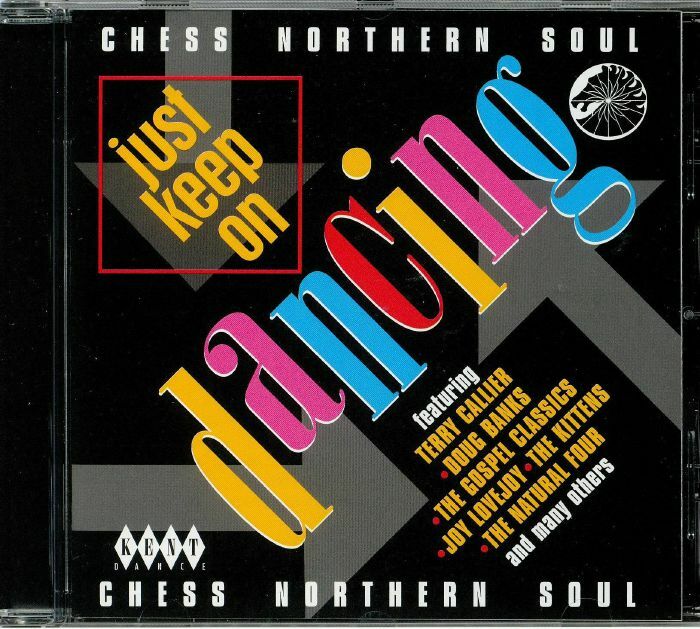 Chess Northern Soul-Just Keep On Dancing was originally released by Kent in 1996, and was the latest in a long line of quality Northern Soul compilations. Twenty-two years later, and Kent still release Northern Soul compilations. One of the best is Chess Northern Soul-Just Keep On Dancing, which is a veritable musical feast. perfect for newcomers or veterans to this very British musical genre. ← EL POLEN-FUERA DE LA CIUDAD-VINYL. How fascinating and crazy about the jump on the cash in wagon.